Only 6' 3", Henry Wilmore used an outstanding work ethic and tremendous dedication to earn All-American honors in 1971 and 1972. In his first varsity season, Wilmore scored 650 points, averaging 25.0 points per game, to lead the team in scoring. He had a career high 41 points against Wisconsin. Wilmore averaged 9.8 rebounds per contest, second best on the team. 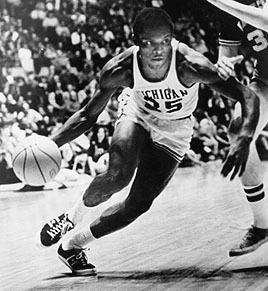 In addition to All-America recognition his sophomore year, he was selected to play in the 1971 Pan-American Games. In 1971-72 Wilmore continued to excel on the court, leading the team in scoring with 24.0 points per game and grabbed 8.6 rebounds per game, again earning All-Conference and All-American kudos. Tough he did not gain a third All-American nod, team co-captain Wilmore put up impressive statistics his senior year, leading the team in scoring for a third year with a 21.8 average. A native of Manhattan, New York, Wilmore was a high school All-American at Rockwood Academy. He finished his Michigan career with 1,652 point, a 23.6 per game average and 573 rebounds. Wilmore was selected by the Detroit Pistons in the fifth round of the NBA draft.